While in Vegas I also had the opportunity to see the new Sony demonstration of home 3-D television. 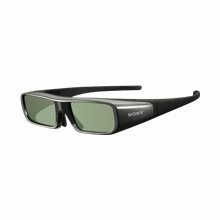 They give you a set of glasses that actually have an on/off switch that allows you to have the 3-D experience on your home television. Sony is leading the pack in a very fast-changing area of projection technology. I hope you don’t buy something one week and have it become obsolete the next. This entry was posted in Boston Museum and tagged interactive, museum, technology. Bookmark the permalink.